After confusing the North and South Korean flags during a football match, you'd think the Olympics would have learned their lesson, but no. 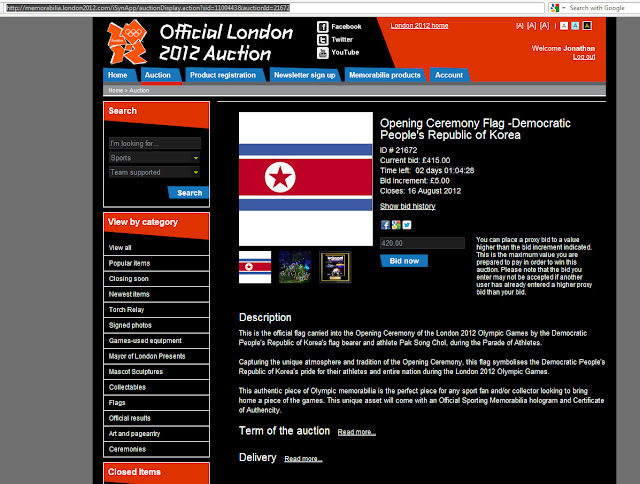 Today on the official auction site (where you can buy items used during the Olympics) one can find both the North and South Korean flags from the opening ceremony for sale. 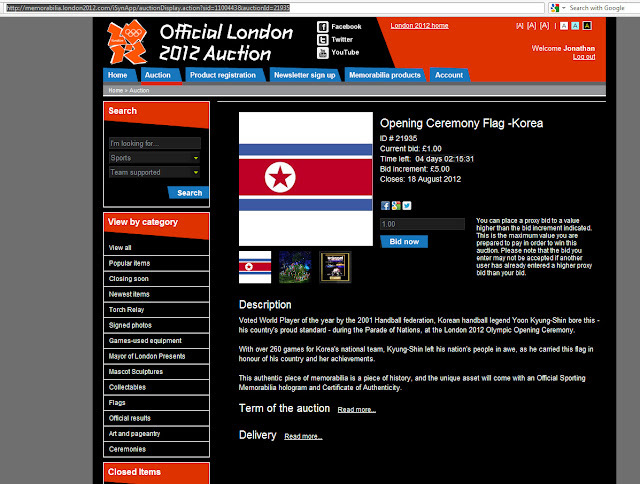 That's the North Korean flag, currently selling for a handsome £415 (not including delivery). And here's the uh... South Korean flag. Only £1 so far. 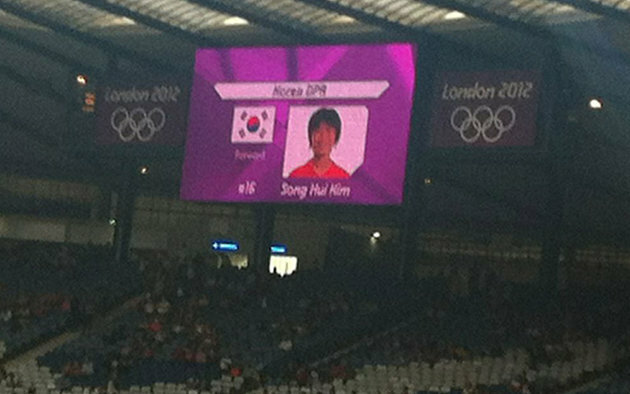 Just to remove any doubt (the official names of the Koreas can be confusing), the text refers to Yoon Kyung-Shin, the famous South Korean handball player. So once again the Olympics have fucked up by confusing the Korean flags although it's the other way round this time, so maybe that balances it all out. Update: They spotted the error (after I emailed them) and have now corrected it, but didn't acknowledge ever making the error in the first place. Hopefully the South Korean nationalist nutjobs will be all over them. Vidabest is Best Online Lowest Unique Auctions Deal including live auctions ,Electronics, Mobile, Computers, jewellery and Home facilities. Check out the free and discount online shopping bidding and Top online auction sites at once. Thank you for another great article. Where else could anyone get that kind of information in such a perfect way of writing. Useful information like this one must be kept and maintained so I will put this one on my bookmark list!